An Inhuman that was not seen in the comics, but rathe referred to as a good friend of Black Bolt’s father, Agon, the former king. Vel was referred to in tale of a newborn’s genetic lineage that Black Bolt was obliged to listen to as part of his kindly duties and the customs of old Atilan. That’s all I got on Vel, so let’s just pretend he or she was super cool and had the power to make just these incredible mix-tapes (this was back in the day, so making mix-tapes was still a thing). A winged Inhuman of the floating city of Aerie. Vera fell in love with and later married the hero known as Red Raven. Together they had a daughter who went on to become the new Red Raven. Some time thereafter, their daughter tragically perished, a victim of the psychotic villain, Arcade. Not long after the tragic loss of Vera’s daughter, all of Aerie was exposed to the Terrigen Cloud. Being an offshoot of the Inhumans, who developed wings through genetic heritage rather than Terrigenesis, the people of Aerie experienced an adverse reaction to exposure to the cloud. It caused them to mutate into savage bird and bat-like mutates with diminished, more primitive intellects. Not being of Inhuman lineage, the original Red Raven remained physically unaffected. Emotionally, however, he was enraged over the loss of his daughter and the fact that his wife and all the citizens of Aerie had been transformed in this fashion. In this angered and sorrowful state, Red Raven assumed the Terrigen Cloud had been an attack by their Inhuman cousins of Attilan. He mounted a counterstrike, planning on crashing the floating city of Aerie into the city of New Attilan in New York. This plot was eventually foiled by the combined efforts of Spider-Man, Captain America, and the new Inhumans, Flint, Naja, Iso, and Inferno. After both cities were saved, Red Raven surrendered and Medusa promised that everything possible would be done to reverse the transformations that had affected Vera and the other citizen of Aerie. To what extent such efforts have been successful remains to be seen. An Inhuman of old Attilan who had purplish skin and an enlarged, bulbous head with numerous tentacles extending from his cranium. He possessed psychic abilities and the ability to accurately discern the truth from a lie. This ability earned Veritus the position of the royal inquisitor. He acted as something of a judge who presided over internal disputes among the populace of Old Attilan. It is unknown whether or not Veritus survived the fall of Attilan during the Infinity Event. The fact that the telepath, Sterilon, has superseded Veritus as Medusa’s inquisitor suggests that Veritus may have perished in the fall of Attilan, been transported to places unknown in the evacuation through the door of Elldrac, or that he has simply retired from hie royal duties. In any case, his current status and whereabout remain unrevealed. Veritus first appeared in Marvel Knights: Inhumans #4. A blind Inhuman, exceptionally tall in stature, with yellowish skin and tendril-like protrusions extending from his eye-sockets. The ends of these tendrils can attach to the forehead of another person, thus allowing Videmus to see that other person’s thoughts and feel their emotions. Videmus worked as a healer on old Attilan, acting as a type of psychotherapist, helping those suffering from inner conflict and confusion. He worked with Quicksilver when he was convalescing on old Attilan after the Mutant had lost his speed powers following M-Day and consequentially attempted suicide. Quicksilver was desperate to regain his powers and he had lobbied King Black Bolt to allow him to be exposed to the Terrigen Mists. Black Bolt had denied this request outright… it was unknown how the Terrigen would affect Quicksilver and it was possible the process would kill him. Quicksilver was willing to take this risk. His being forbidden to go through Terrigenesis had led him to give into hopelessness and severe depression. Videmus had never been especially invested in the rules and power structure of Attilan. Years of being exposed to the unadulterated thoughts and feelings of others had left him with something of a fluid, more chaotic sense of morality, of what is right and wrong. He chose to defy his king and help Quicksilver, telling the mutant how and where he might ferret his way into the chamber of Terrigenesis. Quicksilver followed Videmus’ instructions. Just as Videmus had warned, entering the chamber required that Quicksilver attack and murder the sentry who was standing guard over the chamber. 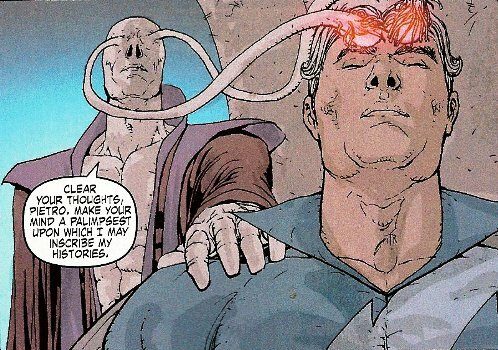 Blinded by his desperation, Quicksilver killed this guard, an Inhuman named Goran Maledicta. He then entered into he chamber and went through Terrigenesis. In more recent tales, it has been revealed that the form of Terrigen contained in the Terrigen Cloud is hugely deleterious, even deadly, to Mutants. In it’s raw form, however, it appeared to endow Mutants with new powers. Quicksilver was bestowed with the capacity to travel short distances through time. Following his Terrigenesis, Quicksilver stole a large cache of the crystals and fled Attilan back to earth. There he used the crystals to transform a number of de-powered Mutants into new Inhumans (although it turned out that such transformations proved to be temporary and the new abilities wore off without subsequent exposure to Terrigen). Quicksilver had additionally abducted his daughter, Luna, and exposed her as well to the Terrigen Mists (endowing the youth with the ability to read and manipulate the emotions of others). Videmus eventually confessed to his role in the theft of the Terrigen Crystals. Quicksilver was ultimately apprehended and Luna reunited with her mother. King Black Bolt considered executing Quicksilver for his crimes and the murder of Maledicta, but he decided instead to banish Quicksilver from Attilan under the penalty of death. Quicksilver’s time-traveling powers waned and at some point he regained his mutant ability for super speed. He was also able to overturn his banishment from Attilan by convincing the Royal Family that his crimes were actually committed by a Super Skrull Imposter. For his role in the crime, however, Videmus was striped of his role as healer and forbidden from ever again using his powers to connect with another. It was essentially a sentence of solitary confinement and Gorgon challenged the sentence stating that it was far too harsh. Yet Videmus did not object. He accepted his punishment with his typical stoicism and left the palace to begin his life of isolation. This was the last we’ve seen of Videmus and his current status and whereabout remain unknown. He first appeared in Decimation: Son of M #2. Vinatos was an Inhuman with green skin, bulbous eyes and a somewhat insect-like physique. Several of his fingers ended in long, scalpel-like sharpened tips. A skilled physician on Old Attilan, Vinatos was promoted to Chief Medical Regent following the Infinity Event and the establishment of New Attilan. Vinatos was keenly interested in the medical properties of the new Inhumans created by way of the Terrigen Cloud. This led him to come into conflict with Inferno (Dante) and his sister, Gabby, when Vinatos tried to perform an autopsy on the siblings’ recently deceased mother. Although they had gotten off on a poor start, Vinatos became friends with Inferno as well as the other new Inhumans (Naja and Flint), helping them adjust to their new lives as Inhumans. He additionally helped Gabby monitor her pregnancy and agreed to help deliver her child in case their were complications due to her Inhuman genetic heritage. Vinatos died valiantly when he confronted The Unspoken. The Unspoken recalled that Vinatos had been those who opposed his rulership and sided with Black Bolt. For this he incinerated Vinatos with a blast of energy. Vinatos’ nobel sacrifice provided the distraction that ultimately enabled Inferno and the others to defeat The Unspoken. Vinatos first appeared in Inhuman #2. Also known as ‘Sun,’ Voor is a Dire Wraith and member of the Universal Inhumans (one of a number of different alien species whom the Kree had subjected to the same Terrigenic experiments as Earth’s Inhumans). As part of a Celestial Prophecy, the regents of these diverse cosmic Inhumans came together and chose Black Bolt of Attilan as their king and leader. As a member of The Light Brigade (a group of warriors made up of Universal Inhumans) Voorr and her comrades among The Light Brigade were sentenced to be sacrificed, an offering to the cosmic gods meant to anoint the creation of the Court of The Universal Inhumans. The Light Brigade stepped through the portal of Eldrac. Rather than sending them to oblivion, however, Eldrac chose to spare The Light Brigade and instead transported them to the Negative Zone. Whiled in the Negative Zone, Voorr and the Light Brigade were captured by Arthrosians. Annihilus, the then lord of The Negative Zone, forced Voorr and her fellow comrades among The Light Brigade to fight in the gladiatorial arena against the Arthrosian champions. Voorr and her colleagues were killed numerous times in the arena and each time, Annihilus used his Cosmic Control Rod to resurrect them so that they might fight, and die, again. Voorr possesses the ability to create large orbs of light and intense heat. With concentration, she can cause these orbs to fire bolts of super hot plasma at a given target. Following the disbanding of the Court of the Universal Inhumans, Voorr returned with her queen to their home world in the Dark Nebula.